The Miyawaki Family Trainees in Neuroscience Award-UH Foundation recognizes excellence in neuroscience at the John A. Burns School of Medicine (JABSOM). It celebrates the achievements of young investigators in the greater neuroscience community of Hawaiʻi and contributes to the foundation for a strong academic program in the neurosciences at JABSOM. This fund was established with a generous gift from the Miyawaki family (read more below). The award is $3,500.00 for the best published peer-reviewed publication in neuroscience by a trainee at JABSOM and will be awarded at the JABSOM Biomedical Symposium in April 2015. The winner will give a short 10-minute presentation at the Symposium. The topic may be related to basic science, clinical, biostatistical/epidemiological or engineering science. All clinical and basic science disciplines are encouraged to apply: Neurology Psychiatry, Psychology, Anatomy, Pathology, Physiology, Cell Biology, etc. The criterion for the trainees is that they be an: undergraduate, graduate, or medical student at JABSOM; a new PhD who applies for the award within 12 months of receiving their PhD degree at JABSOM; or a medical resident or fellow sponsored by JABSOM. The peer-reviewed article must be in press or published within the last 12 months. Please submit your manuscripts and questions to Dr. Mariana Gerschenson at gerschen@hawaii.edu. Dr. Edison H. Miyawaki and his son Dr. Edison K. Miyawaki have enjoyed successful careers in health care. Dr. Miyawaki, Senior is the chairman/president/CEO of Nu`uanu Hale and Liliha Healthcare Center, both skilled nursing facilities. 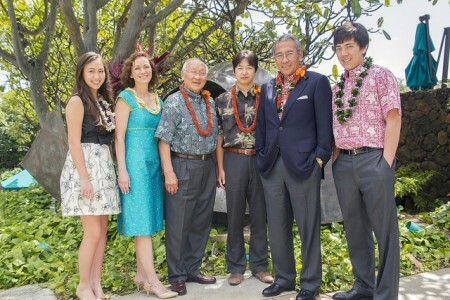 “Gifts like the Miyawaki Award Endowment are generous beyond the dollar value. They are gifts to future generations who may live better and longer because of a long-term commitment to both clinical and basic science research which lead to new and better therapies.” Dr. Jerris Hedges, Dean of JABSOM. Dr. Miyawaki has supported UH as a volunteer in myriad ways including serving on the ʻAhahui Koa Ānuenue board, John A. Burns School of Medicine steering committee and the chair of the Hawaiʻi Warrior Football Centennial Celebration Gala. His son, Dr. Miyawaki, has been a board-certified neurologist since 1993 and currently serves an assistant professor at Harvard Medical School with offices at Brigham and Women’s Hospital, Department of Neurology.